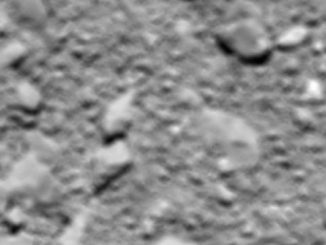 Just before settling to a soft crash landing Friday, the European Space Agency’s Rosetta spacecraft captured close-range images of comet 67P/Churyumov-Gerasimenko, peering into a stadium-sized pit and recording a final dataset to keep scientists busy long after the mission’s end. 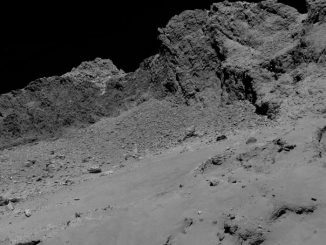 Europe’s Rosetta mission ended its 12-year mission Friday with a slow-speed belly-flop on comet 67P/Churyumov-Gerasimenko, concluding an interplanetary odyssey that gave humanity a first close-up introduction to a class of objects which has stimulated imaginations for millennia. 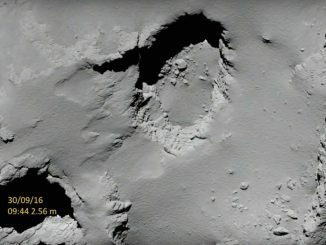 Europe’s Rosetta spacecraft closed out a historic 4.9-billion-mile journey Friday with a slow-speed crash into the nucleus of comet 67P/Churyumov-Gerasimenko, the tiny world it has studied for the last two years, capturing some of the mission’s best science data to help unravel the inner workings of the comet. 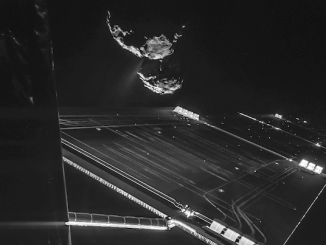 Confirmation of the crash landing arrived on Earth at 1119 GMT (7:19 a.m. EDT). 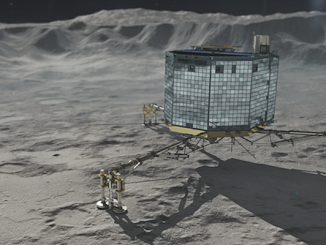 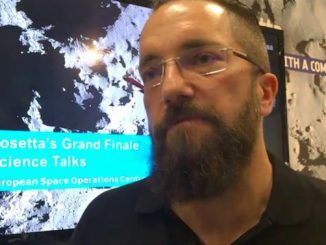 Astronomy Now speaks with Matt Taylor, Rosetta project scientist, at the European Space Agency’s mission control in Darmstadt, Germany, about the plan to crash land the spacecraft on comet 67P/Churyumov–Gerasimenko. 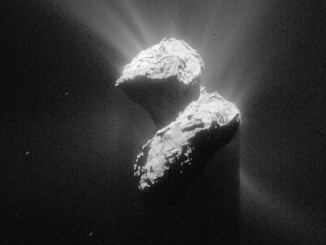 The European Space Agency’s $1.6 billion Rosetta spacecraft closed in Thursday for a deliberate crash landing on the surface of comet 67P/Churyumov-Gerasimenko early Friday, a slow-motion kamikaze plunge to bring the enormously successful mission to an end after more than two years of unprecedented close-range observations. 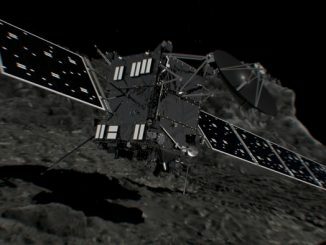 Emboldened by renewed contact with Europe’s comet lander, engineers are repositioning the mission’s Rosetta mothership this week to establish a reliable a communications link with the dishwasher-sized Philae landing craft, a prerequisite for resuming a science campaign abbreviated by a power shortfall last year. 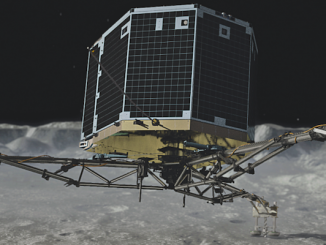 The European Philae comet lander, out of power and presumably lost after bouncing into heavily shadowed terrain last November, phoned home Saturday after finally getting enough sunlight on its solar panels to transmit data to the Rosetta orbiter for relay to Earth. 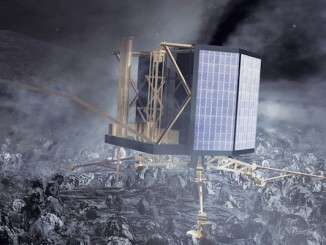 Europe’s Rosetta spacecraft is trying to contact the Philae landing probe for the first time since the robot fell silent after a bouncy landing on a comet in November.